Have a look at these public domain photos of Chinese things. After spending the first 30 years of my life in Canada, I've lived in China for more than 15 years , but I'm still constantly finding stuff here that surprises me. If you want to understand more about life in mainland China, you need to look at more than just Chinese places and Chinese people. Look at these facets of modern Chinese culture that you might see anywhere in China. Some of them I like. Some make me laugh. Others just mystify me. 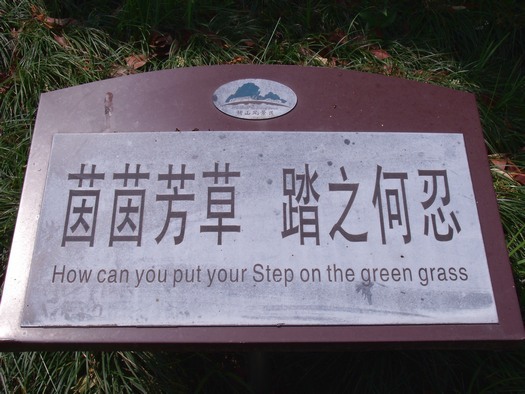 One constant source of amusement is English signs in China. Some of the translation mistakes are understandable but often I'm left wondering what in the world they're trying to say, or at least why they chose those particular words! Click here to see some funny Chinese signs. Here is a second page of funny signs in China. "Chinglish", a.k.a. English with Chinese characteristics, is a definite part of modern Chinese culture, and provides a lot of laughs for we native English-speakers who live here. I'm sure that sometimes my efforts in Chinese ("Eng-nese?") are just as hilarious to my Chinese friends. You've got to be able to laugh at yourself if you're going to attempt a foreign language. In the quest for international trade, Chinese companies often put English on the labels of their products. Even if it is just sold domestically, this gives a certain flair to the thing. The English on these labels is often the result of word-for-word translation by people or computers, and the resulting funny labels are sometime hilarious. Click here or on the photo below to see more funny English on Chinese products. What other things are noteworthy? There's Chinese art, of course: paintings on wood and tile, kites of great beauty and intricate design, and sculpture both traditional and modern. Many Chinese bells and ancient musical instruments are also works of art. And don't forget about the Chinese dragon. 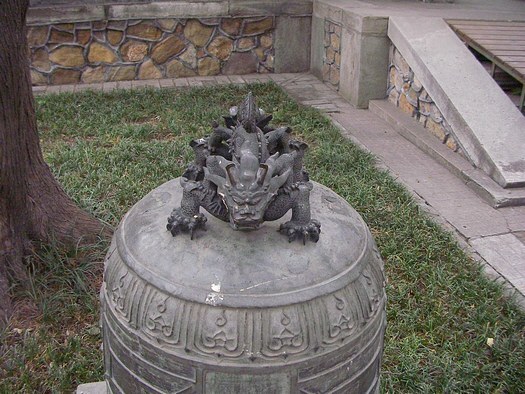 Images of dragons are seen everywhere, but the Chinese idea of a dragon is dramatically different from the Western concept. Click here to see particular Chinese art form called the Nine-Dragon Screen. Click here to see details of colourful glazed-tile dragons on that screen showing how beautiful Chinese dragon art can be. Chinese lion statues are also commonly seen. There is an amusing and amused-looking lion statue on this page along with some classically-designed Chinese bridges. This page shows a Chairman Mao statue and a modern woman beside an ancient Buddhist temple's incense burner. There are too many fascinating Chinese things to show them all here, but I hope these samples give you a taste of Chinese culture. e are too many fascinating Chinese things to show them all here, but I hope these samples give you a taste of Chinese culture. See Chinglish (a Chinese version of English) labels on products sold in China. See a nine-dragon ceramic screen and its Chinese dragons in detail. See a Chinese lion statue and Chinese bridges. See a Chairman Mao statue and a large old-style Buddhist incense burner. The webpage text here is Copyright 2009-2013 by Asia-Insider-Photos.com. The photographs are public domain, free for your use.